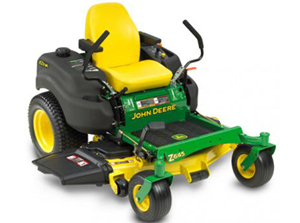 John Deere are designed for comfort, conveniance and performance ,John Deere lawn tractors are the ultimate in lawn maintenace.You'll love the exceptionally smooth ride that comes with their high quality transmission and fully welded frame. 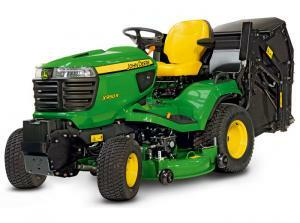 Standard series lawn tractors are well engineered and and of extremely high quality. Select Series models deliver next-level performance thanks to a heavy-duty robotically welded frame, powerful fuel efficient engines and high -precision cutting technoligy, formed from a single sheet of heavy gauge steel,the select series feature "Edge Xtra" mowing decks benifitting from the superior build quality,delivering unmatched performance. With six models and a wide range of features and options to choose from, the X100 Series has something for everyone. These lawn tractors are powered by 12.5hp up to 22hp engines and built for years of trouble-free service, and combine superb cut quality with outstanding ease of use. With decks ranging from 36" to 48" cutting widths. More solidly constructed than the 100 series the X300 Series tractors boast more manoeuvrable even in the most confined areas offering a more comfortable ride quality.Powerful V-twin engines with 20hp up to 22hp and outstanding fuel efficiency. Pure precision cut with decks ranging from 38" to 48" cutting widths. Every single blade of grass is perfectly cut leaving an immaculate finish. The X500 Series lawn tractor in terms of size, power and performance delivers a powerful cut on difficult terrain.With features like 24hp up to 26hp V-twin engines, easy to use hydraulics to raise and lower the mowing deck, hydrostatic transmission, Power steering, low centre of gravity, long wheelbase, differential lock and larger wheels make a real difference. Ideal for homeowners who need to deal with varied landscaping features, challenging turf and a variety of tasks. With decks ranging from 48" to 54" cutting widths. 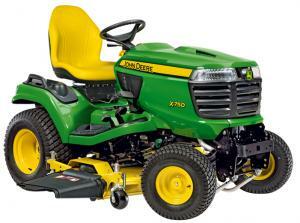 The X700 series diesel powered tractors are more than just a mowing machine perfectly suited for long hours of work. With features like easy to use hydraulics to raise and lower the mowing deck, the mower deck is shaft driven, hydrostatic transmission, power steering and a low center of gravity. An optional rear 3-point hitch with 540rpm rear PTO, decks ranging from 48" 54" 60" cutting widths and optional quick attach front hydraulic angling hitch add the versatility to carry implements like snow blades and rotary brushes and other powered implements. The X950R mowing tractor thrives on hard work. This Rear Discharge/Rear Collect model offers two options either low dump or high dump and has a rugged steel frame and mower deck for years of trouble-free service, with decks ranging from 48" to 54" cutting widths. The high-torque diesel engine and heavy duty wheel motors can power across tough terrain all day. And thanks to great ergonomics and intuitive controls, so can operators! 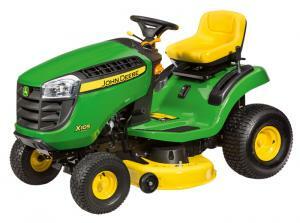 A zero-turn mower range that's smarter by design and easier to use. The EZtrak series deliver on-the-spot turning, controlled by intuitive motion control levers meaning there is no obstacle this machine cannot easily and efficiently manoeuvre around - saving you time and effort. The EZtrak Zero-Turn Mowers make work faster, easier and smoother for everyone. 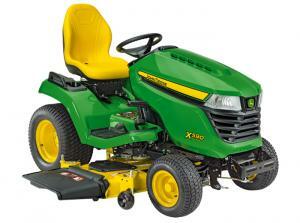 These nimble machines help you to cut down mowing time without sacrificing quality. There is no obstacle they can not manoeuvre around easily and efficiently and you will be impressed by their exceptional trimming capabilities. With decks ranging from 42" to 48" cutting widths.